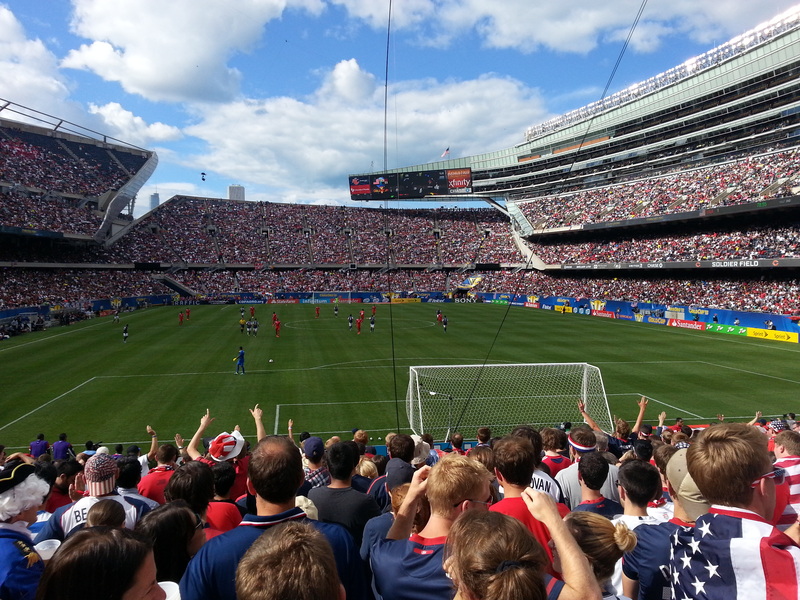 On Sunday, July 28 2013, I attended the CONCACAF Gold Cup Final in Chicago at Soldier Field in the American Outlaws supporter section. If you are unfamiliar with the American Outlaws, they are the fastest-growing USMNT supporter group in the United States, and they offer quite the gameday experience. It’s difficult to see, but one USMNT supporter had a hilarious American flag bikini t-shirt on that was a huge hit at the bar. 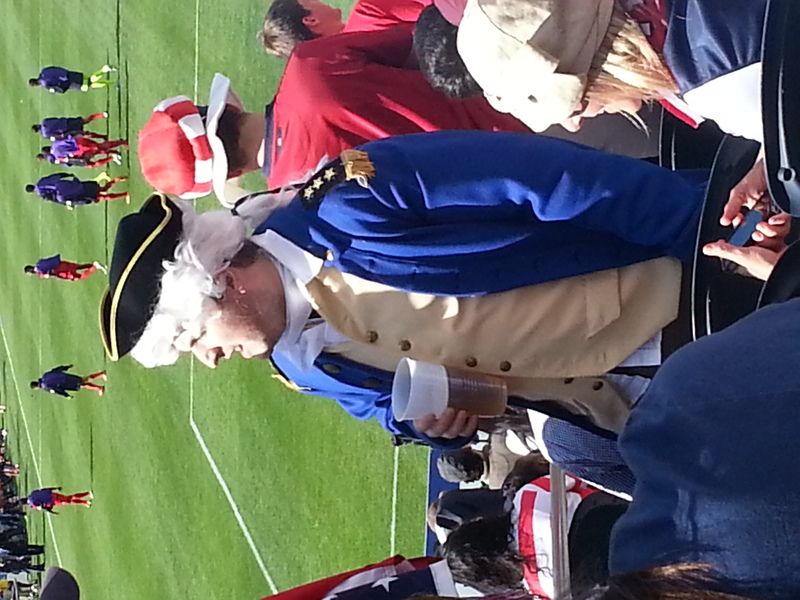 Most fans showed up in some sort of USA paraphernalia, whether it were a USMNT jersey, flag scarf, Captain America outfit etc, ‘Merica was well represented on game day. 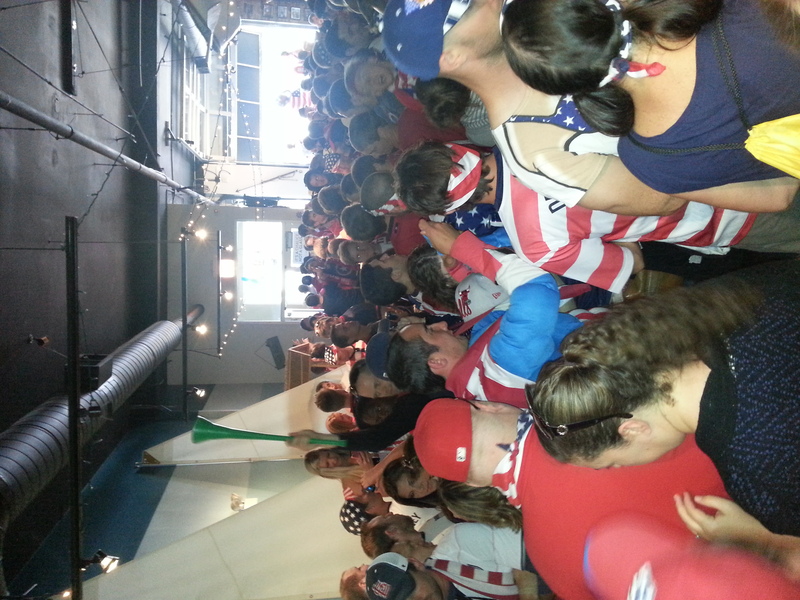 The majority of the crowd at the bar marched over to the stadium at approximately 1:15PM. Having only been there a few minutes, my friends and I decided to hang out for about another 45 minutes in order to take advantage of the gameday beer specials before making our way over to Soldier Field at 2:00PM. 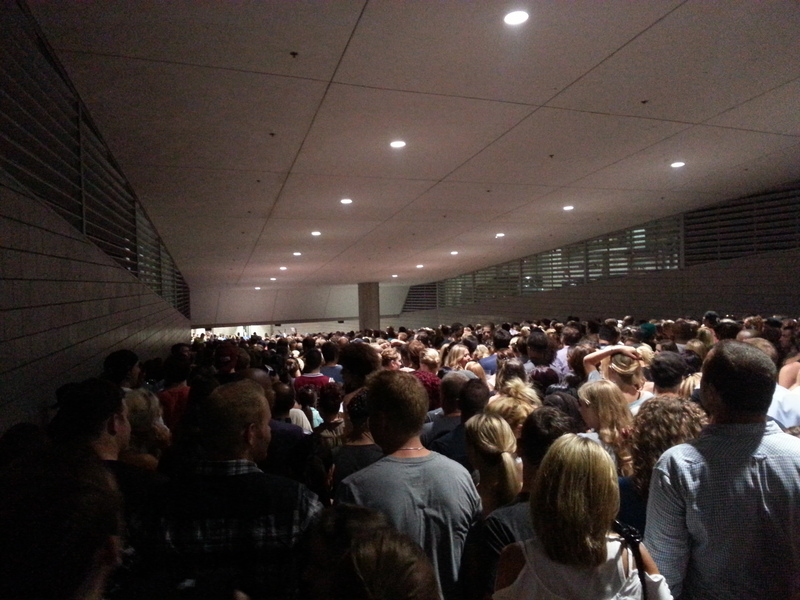 With a 3:00PM start time, we figured we’d make the opening whistle, but the same log-jam I experienced on Monday at the Jay-Z and Justin Timberlake concert held us up considerably. If you couldn’t tell, we had pretty decent seats. We were sitting in section 123 thanks to a pre-sale code provided by the American Outlaws that allowed us to purchase tickets for $63/each back in March. At the time there was no guarantee the USMNT would make the final, but with a rather weak Gold Cup competition I figured it was a good gamble, and securing the tickets early paid off. There were people in our section that resorted to StubHub in order to get tickets, some of which paid more than twice the initial rate. In the 68th minute, one of my favorite USMNT up-and-coming players Brek Shea was subbed in and wasted little time getting the US on the board with a 69th minute tap-in goal after a Landon Donovan whiff. The supporter section went nuts (even though the goal was scored on the opposite side of the field), as fans hugged and spilled beer all over random strangers. 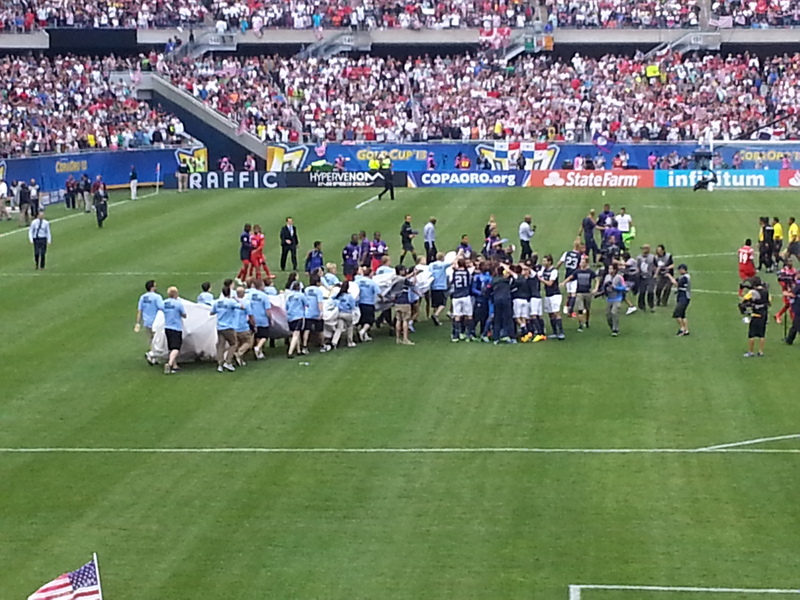 The score would hold true for the remaining 21 minutes of the game as the USMNT captured the Gold Cup trophy in a 1-0 win. Although I’ve been to many USMNT games with my hometown supporter group, the Pearl River Hooligans, this was my first cap with the American Outlaws and surely won’t be my last. I’ll be going to Brazil next summer for the 2014 World Cup with AO for a 13 night stay and hopefully a few more games stateside before then. If you’re serious about USMNT soccer and are looking for the best way to get in touch with other fans, head over to http://www.theamericanoutlaws.com/ and join their group. Membership is $24 per annum, and each year they send you a shirt and an american flag bandana in the mail. Be sure to join your local chapter group on Facebook in order to get the scoop on USMNT ticket sales and watch parties/gameday events.